Prince fans beside a sea of purple balloons and flowers at a memorial wall outside the Paisley Park compound of the music legend, who died suddenly at the age of 57, just outside Minneapolis on April 24, 2016. 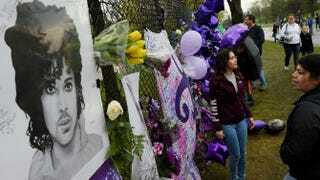 On the heels of the sudden death of Prince, the singer’s family has confirmed that Paisley Park will be turned into a Graceland-style museum. “We will turn Paisley Park into a museum in Prince’s memory. It would be for the fans. He was all about the fans—this would remember his music, which is his legacy. Prince was always private but would have wanted his music remembered,” Prince’s brother-in-law Maurice Phillips told The Sun. Prince died Thursday at his Paisley Park estate outside Minneapolis; the cause of death has yet to be announced. A private memorial service was held Saturday for a small group of friends and family.